Dating isn’t always easy, especially for us Catholics who take vocation discernment seriously. Luckily, we can always ask for a little help from our heavenly friends and our Blessed Mother. If you’re Catholic, single, and looking for a spouse, here are 5 novenas you can pray for a little divine intercession. Please recommend it to your daughter, the Blessed Virgin Mary, and place it before the throne of Jesus, so that he may bring it to a happy issue. Continue to intercede for me until my request is granted. But above all obtain for me the grace to one day to see my God face to face, and with you and Mary and all the saints to praise and bless him for all eternity. Amen. Saint Anne, help me now and at the hour of my death! Good Saint Anne, intercede for me! Glorious Saint Raphael, Patron and lover of the young, I feel the need of call­ing to you and of pleading for your help. In all confidence, I open my heart to you to beg your guidance and assistance in the important task of planning my future. Obtain for me through your intercession the light of God’s grace so that I may de­cide wisely concerning the person who is to be my partner through life. Angel of Happy Meetings, lead us by the hand to find each other. May all our movements be guided by your light and transfigured by your joy. As you led the young Tobias to Sara and opened up a new life of happi­ness with her to holy marriage, lead me to such a one whom in your angelic wisdom you judge best suited to be united with me in marriage. Saint Raphael, loving Patron of those seeking a marriage partner, help me in this supreme decision of my life. Find for me as a helpmate in life the person whose character may reflect some of the traits of Jesus and Mary. May he (she) be up­right, loyal, pure, sincere and noble, so that with united efforts and with chaste and unselfish love we both may strive to perfect ourselves in soul and body, as well as the children it may please God to en­trust to our care. Saint Raphael, Angel of chaste court­ship, bless our friendship and our love that sin may have no part in it. May our mutual love bind us so closely that our future home may ever be most like the home of the Holy Family of Nazareth. Offer your prayers to God for the both of us and obtain the blessing of God upon our marriage, as you were the herald of blessing for the marriage of Tobias and Sara. Saint Raphael, Friend of the young, be my Friend, for I shall always be yours. I desire ever to invoke you in my needs. To your special care I entrust the decision I am to make as to my future husband (wife). Direct me to the person with whom I can best cooperate in doing God’s Holy Will, with whom I can live in peace, love, and harmony in this life, and attain to eternal joy in the next. Our Lady of the Angels, pray for us! Oh, St. Joseph whose protection is so great, so strong, so prompt before the Throne of God, I place in you all my interests and desires. Oh, St. Joseph do assist me by your powerful intercession and obtain for me from your Divine Son all spiritual blessings through Jesus Christ, Our Lord; so that having engaged here below your Heavenly power I may offer my Thanksgiving and Homage to the Loving of Fathers. “Loving Father, You know that the deepest desire of my heart is to meet someone that I can share my life with. I trust in your loving plan for me and ask that I might meet soon the person that you have prepared for me. Through the power of your Holy Spirit, open my heart and mind so that I recognize my soulmate. Remove any obstacles that may be in the way of this happy encounter, So that I might find a new sense of wholeness, joy, and peace. Give me the grace too, to know and accept, if you have another plan for my life. I surrender my past, present, and future into the tender heart of your Son, Jesus, Confident that my prayer will be heard and answered. St Valentine, pray for me. If you’re either single and looking or you’ve met a great guy/girl and want a little heaven help in your discernment try the 54-day Rosary novena. 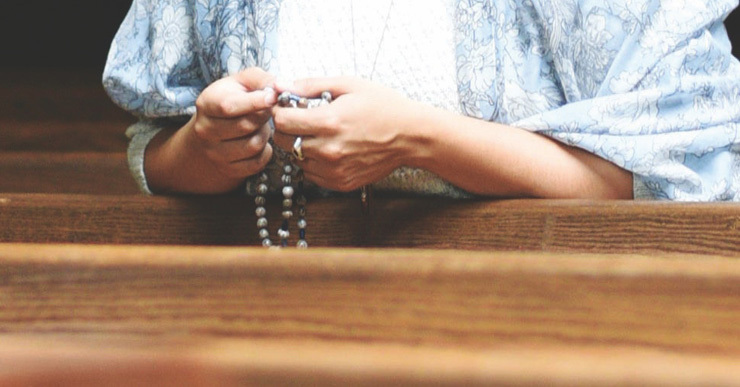 The 54-day Rosary novena is one of the most powerful novenas one can pray. Catholic speaker and musician Jackie Francois-Angel prayed it and it led her to her now husband Bobby Angel. While it can be prayed at any time of the year, it’s recommended to pray it from All Saints’ Day through Christmas Eve since the dates are easiest to remember. You can either pray the traditional 15 decades or pray the version with the added Luminous Mysteries; the choice is yours. You can find both versions on this website. You can choose any of these novenas or another novena of your own choice. If you feel confused or uneasy during the novena, it’s very likely not coming from God. If you feel peace during and/or following the novena, you know you’re on the right path. Whichever novena you choose, remember that God will always guide you down the right path that is part of His will for you. Place all your trust in Him and enjoy the dating season.